عندما تزور خليج هيرفى, ستشعر أنك في بيتك في White Crest Luxury Apartments الذي يقدم لك إقامة متميزة و خدمات عظيمة. يمكن من هنا للضيوف الاستمتاع بسهولة الوصول إلى كل ما تقدمه هذه المدينة النابضة بالحياة. يوفر الفندق بفضل موقعة الجيد وصولاً سهلاً إلى أهم معالم المدينة.
. إن الخدمات الممتازة وحسن الضيافة العالي في White Crest Luxury Apartments تجعل إقامتك تجربة لا تنسى. يمكن للنزلاء الاستمتاع بالميزات التالية: واي فاي مجاني في جميع الغرف, واي فاي في المناطق العامة, صف السيارات, مرافق للشواء, جرائد أثناء إقامتهم في هذا المكان الرائع. ادخل إلى واحدة من الغرف 30 وتخلص من عناء نهار طويل بمساعدة مجموعة كبيرة من الخدمات كمثل تلفزيون بشاشة مسطحة, غرف لغير المدخنين, مكيف هواء, تدفئة, مكتب الموجودة في بعض الغرف. يقدم الفندق العديد من الفرص للاستجمام كمثل حوض استحمام ساخن, حمام سباحة خارجي, مسبح (للأطفال), ملعب تنس, حديقة. 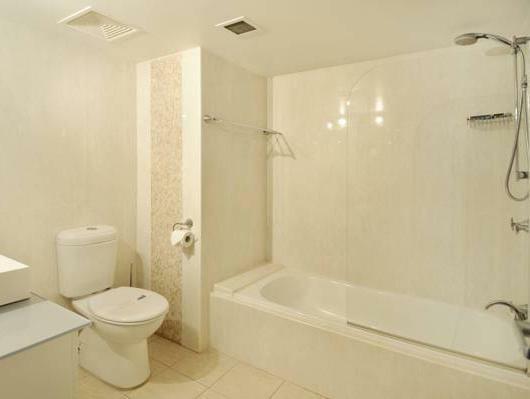 إن White Crest Luxury Apartments هو خيار ذكي بالنسبة للمسافرين إلى خليج هيرفى، بما يوفره من إقامة هادئة ومرحة. Room was perfect, well laid out. Location was great opposite the water, great for swimming, walking eating out options was very good. Would stay here again very reasonably priced. I arrived and was not greeted happily, he looked at me and raised his eyebrows as if to say what are you doing here. Even female behind desk didn't say hello. Beds were so hard I slept on the couch, dishwasher full from previous people, I had to unpack it to use anything. wasn't happy with my room and will stay somewhere else next trip to Hervey Bay. Our stay was pleasant. The apartments are very roomy and the rooms were as well. Full size laundry was great. Great place to come with the family. We stayed for a week. Central location yet Quiet. Well maintained apartments. Manager was helpful and gave us good discount for Fraser Island booking. Beach was just across the road. Amazing beach: clear and warm water, soft sand, safe swim as there are no big waves.Two really nice cafés on the beach and in the vicinity of the hotel. We will definitely come back to White Crest apartments. Our stay was enjoyable. 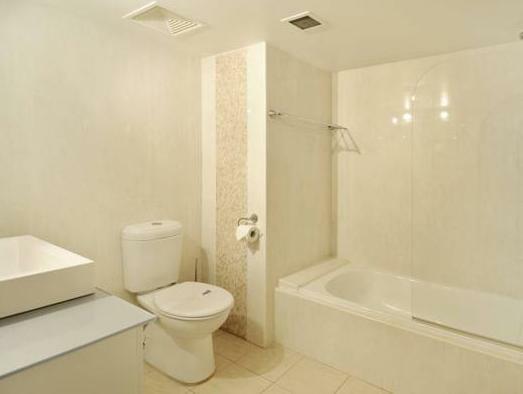 The rooms are larege, clean and well equiped with full kitchen and dining area. Laundry facilites in the main bathroom were a benefit. Overall a very enjoyable stay. Considering the cost per head the apartment was good value. The kitchen was short of a few things which made eating at the apartment a bit difficult but we managed. Bedrooms and lounge were comfortable and the whole apartment was roomy. Kitchen was showing its age a little but everything worked well. 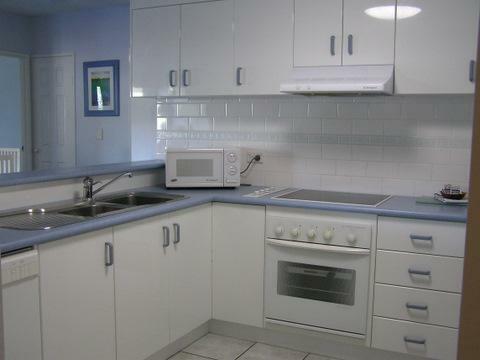 Nice quiet location, large self contained unit. The living room is large, with a nice large balcony. Simple but well equipped kitchen. A little bit of a walk (10-15min) from bars/restaurants which made for a nice quiet sleep at night. Location, friendly and easy access to tours. Hassel free and very helpful friendly staff. Robert did not hesistate to arrange last minute tour of Frazer Island which I highly recommend. Initially, I was considering hiring a 4x4 and self drive Fraser Island when Robert recommended "Unique Fraser" one day tour agency. I strongly recommend this agency for those unfamiliar with the Island Terrain as the tour guide/driver Chris not only just drove for us but also provided invaluable geograhic, nature and indiginous folklore...Chris poessessed excellent subject knowledge and a very skilled all terrain driver. Location, close food outlets, opposite beach. We enjoyed our stay here, friendly staff, great amenities,close to shops & restaurants. child friendly premises. This was to be the highlight of our holiday and so we 'splashed out' on 4.5-star accommodation. The apartments are massively in need of refurbishment; the showers kept falling off the wall, the tiling in the bathrooms had mold, the insect netting had holes in it (not ideal for keeping out mosquitoes), the net curtains were brown, the floor clearly hadn't been hoovered before our arrival (there were pieces of coral on the floor which our 7-month old could have put in his mouth) and lastly, our sea-room view (which we paid extra for) only had a sea-view from one window if you stood at an angle as we were placed at the side of the hotel, furthest from the beach. All in all, this wasn't too bad - the rooms were spacious, we had all of the amenities that we required and it was fairly quiet but it definitely was not 4.5-star, nor was it luxury. we were a group of 2 mature couples, one couple from scotland. the hotel arranged a fraser island trip at short notice with no fuss (pity it rained) but still a good day. good roomy secure parking with easy access. 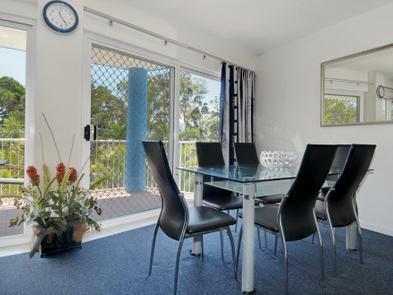 across road to beach, restaurants & shops within easy walking distance. we thoroughly enjoyed our stay. we did not use hotel food facilities.